The 570-hectare artificial lake Lac de Montbel is situated not far from the Pyrenees in southern France. This public water located in a beautiful setting overlooking the mountains with many big carp of more than 20 kilos. Night fishing is allowed on Lac de Montbel, where many Dutch, British and German anglers fish. 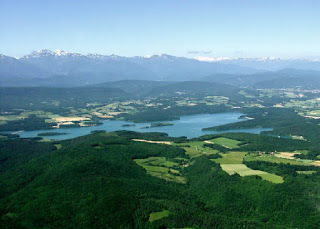 The relatively unknown Lac de Montbel is located in the French department of Ariege not far from the Spanish border. The setting is beautiful with views often partly snowy peaks. An interesting feature of Montbel is that it is composed out of four different, unconnected waters. Lac de Montbel is one of the many French resevoirs created for power generation decades ago. In recent years, the lake has been flooded with anglers from the UK, Netherlands and Germany, often to the dismay of the local French fishermen. The water is known to be difficult and holds some very big carp. Night fishing is allowed under strict conditions. Lac de Montbel is made up out of four different waters, with two very small lakes (La Guinguette and Les Baylards), a large lake with a constant water level and one very large lake (the actual lake) with a variable water level . Lac de Montbel is not far from the Spanish border: click on the map for the exact details on our Dutch website. The maximum depth of the Lac Montbel is 30 meters. 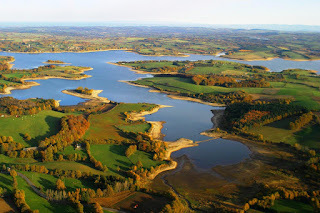 Carp Anglers can reach the lake, which is surrounded by a road and there are two places where boats can be put into the water: at Léran and Montbel. By far the largest part of the lake is the 'lac variable', which takes its name from the fluctuating water level: the level fluctuates between 10 and 15 meters. The second largest lake is called "constant pool", and has a size of 80 hectare. The water level varies little here and this piece often contains much weed. Of the two smaller lakes (1 hectare and 0.8 hectare) the latter one is the least interesting because it is managed by local federation who has knowingly carp to increase fishing opportunities for local fishermen. The average catch here is however relatively low at between 2 and 10 kg. Night fishing is allowed in the entire area, except for a zone of 300 meters near the dam. By cutting up two tents are allowed and the use of backleads is recommended due to the requirement that fishermen to make their lines visible. Who goes fishing at night may do so up to 6 consecutive nights per site. In July and August the bivvy has to be packed during daytime (before 0900 am). In addition, the site should be well lit to make clear that fishermen are active at the lake. Lac de Montbel is known as a difficult public water, with a relatively thin carp file. However some very large specimens of more than 20 kilos are present. The chance that you first catch a big bream is quite large, as it is more known for the huge specimen of more than 8 kg. Especially the second largest lake that is recommended, but you should fish here early in the year because of the weed beds that show up during the summer. Besides big bream there is also big catfish at Lac de Montbel, with specimens up to 2 meters. For more information and permits you can contact the local French administrator, in this case the AAPPMA of Ariege. For more information see www.peche-ariege.com . 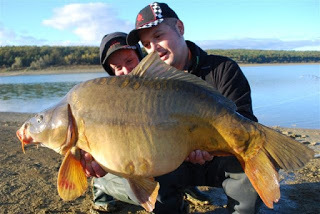 On the Internet we found a nice session report from 2011 of Catch Carp Team at Lac de Montbel. Check the video below.